1. Gently pull the front cover toward you to remove the protective front cover. 2. Gently push the device holder towards the left (1) and slide it into either position A or B (2) depending on the size of the mobile device you want to use. ●● Position A: is used for either a Samsung Galaxy Note5 or Samsung Galaxy S6 edge+. 3.Verify that your device volume is on and not set to silent. Caution: If you insert the mobile device tilted to one side, it may cause discomfort. 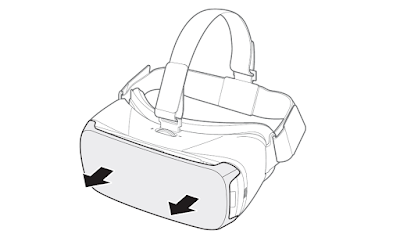 4.Carefully insert the mobile device (face down) at an angle into the center of the Gear VR and then insert the Gear VR connector (1) into the mobile device’s USB port. 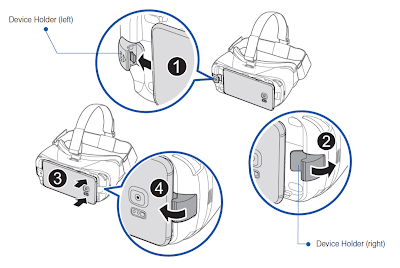 Note: Ensure that the connector is fully inserted into the mobile device’s USB port. The device makes a sound when properly connected. Caution: Do not forcefully insert the connector into the mobile device as this may damage the connector. Improper installation can scratch the mobile device. 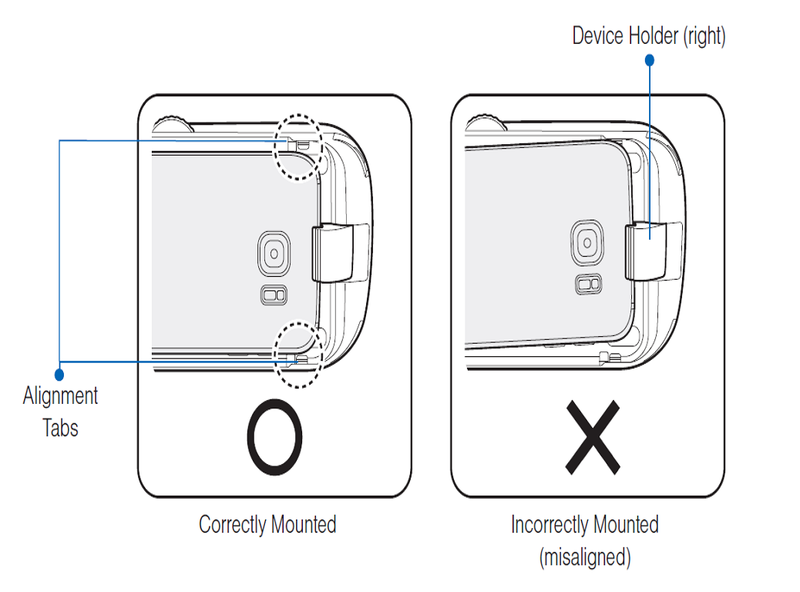 5.While pulling the device holder (right) outward (2), carefully push the opposite end of the mobile device downward (3). 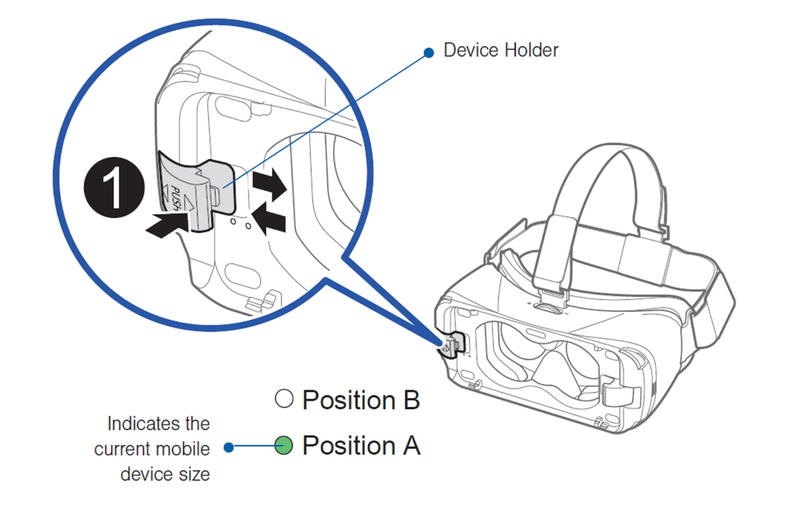 6.Gently push down on the device holder (right) (4) until the mobile device locks into place. Caution: If the mobile device is not securely locked, the mobile device may accidentally separate from the Gear VR and be damaged. 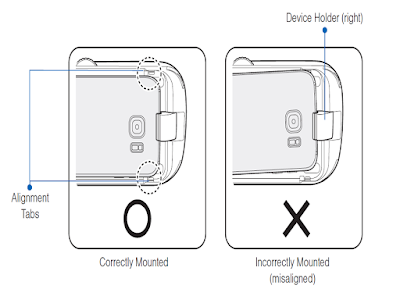 Do not twist or bend the Gear VR’s connector when you connect or disconnect the mobile device. Doing so may damage the connector. 7.Verify the orientation of the mobile device. Caution: If you insert the mobile device tilted to one side, it may cause discomfort. In this case, the mobile device screen will not be aligned properly to the lenses. Note: Verify that your device volume is on and not set to silent. If the sound is not emitted when you insert the connector into the mobile device, the Gear VR did not recognize the connection. Carefully reconnect the mobile device until you hear the sound. Caution: Do not leave the Gear VR in direct sunlight. Exposure to direct sunlight can damage the Gear VR and the connected mobile device.